Are you a fan of recycling…well this blog is about an excellent system that I’m sure will hold your interest. 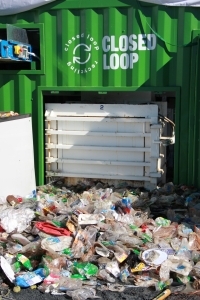 I’d like to start this blog with two thank you’s to Karen Rudkin, Acting Waste Strategy Officer for Gold Coast City Council for passing on an invitation to view the most amazing mobile recycling plant and to Cheryl Bailie from Closed Loop for squeezing me into the tour group. The invitation came from Closed Loop to view their Turnstile 21 fully portable waste separation unit at Splendour in the grass festival in the beautiful township of Byron Bay. I never need an excuse to visit Byron where I have friends and colleagues from my Surfrider Foundation days, Hey Don & Rusty! Arriving early in Byron to a magnificent day I went straight to the beach to check the surf but unfortunately the swell was non-existent. But Byron is full of wonderful experiences and people so I wasn’t too surprised to find these magnificent mandalas racked into the sand. As they say a photo says a thousand words, so here is this wonderful simple but complex mobile system called Turnstile 21. Some brilliant news has just come to hand from the man behind the SEM systems at Splendour, Matt Morris, who is the newly appointed General Manager of the North Byron Parklands. Approvals have been given by the New South Wales Department of Planning for a detailed management system for this area which takes in a stunning 660 acre property at Yelgun in the north of the Byron Shire. “Outdoor events are approved for a trial period of five years up to the end of 2017. Outdoor events following the trial period will require a further approval from Byron Council under Part 4 of the EP&A Act. Three events per year will be permitted during the trial period. Up to a maximum of 10 event days will be permitted each year during the trial. No event must exceed 4 event days. I’m sure all festival goers would want to congratulate Mat and the team for their work in the past at this event and for a bright future for events and this parcel of land. Byron Bay would have to be the leading area in sustainable events, between Splendour and Peter Noble’s Bluesfest they have won many awards. I hope other events confer and take note of these festivals and these practises start to thrive which will be to all our benefits. If your favourite festival is not practising SEM yet and you’d like to see it “Go Green” maybe drop a few hints in their web site comments section or give them a call and let them know you think it’s a great direction to go in.